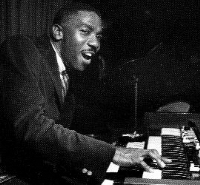 "Within three days [of Jimmy Smith's debut in 1955] the news reached me about this 'insane' organist and I drove down to dig for myself. What I heard was a cat playing forty choruses of Georgia Brown in pure 'Nashua' tempo and never repeating. I heard futuristic, stratospheric sounds that were never before explored on the organ." Jimmy Smith was born in Norristown, Pennsylvania in 1925. Both of his parents were pianists, and his father became his primary teacher, although he admitted to Leonard Feather that Bud Powell in neighboring Willow Grove also had an impact. A prodigy who won a Major Bowes contest in 1935, Smith quickly gained experience working throughout western Pennsylvania, performing on the radio in Philadelphia, and teaming with his dad for nightclub work. After serving with the Navy in the Pacific toward the end of World War II, he returned to Philadelphia and began formal musical training, studying harmony and theory at the Halsey Music School (Clifford Brown was a classmate), string bass at Hamilton School of Music, and piano at Ornstein through 1950. It was while playing in the rhythm-and-blues combo of Don Gardner, who Smith joined in 1952, that he heard Wild Bill Davis and became interested in the organ. This led Smith to intensive self-tutoring for three months in 1955, a process he described in detail to Feather: "When finally I got enough money for a down payment on my own organ I put it in a warehouse and I took a big sheet of paper and drew a floor plan of the pedals. Anytime I wanted to guage the spaces and where to drop my foot down on which pedal, I'd look at the chart." "Sometimes I would stay there four hours, or maybe all day long if I'd luck up on something and get some new ideas, using different stops. I'd eat breakfast and then take my lunch to the warehouse with me and stay there until I was satisfied that I'd done what I needed to for that day." In the summer of 1955, Smith was ready to show the world what he had learned, and opened as a single in an Atlantic City club. By September, Smith had his own trio, and Babs Gonzales had become his manager. Gonzales wasted no time in contacting Alfred Lion of Blue Note. Smith was making his first New York appearance, at Small's Paradise in Harlem, in January 1956, when Lion heard him and immediately signed him to a contract. While a downtown gig at the Cafe Bohemia that followed hard on the heels of the Small's Paradise engagement was also important in Smith's breakthrough, what really turned him into an instant phenomenon were his Blue Note recordings. There were albums by his regular trio, all star trios with Kenny Burrell, Grant Green, Art Blakey and Philly Joe Jones, quartet albums featuring Lou Donaldson, Percy France and Stanley Turrentine, and the great sextet jam sessions. The date with Lee Morgan, George Coleman and Curtis Fuller and another with Morgan, Lou Donaldson and Tina Brooks produced his great House Party and The Sermon albums. Another with Ike Quebec, Jackie McLean and Blue Mitchell yielded Open House and Plain Talk. After his move to Verve in 1962, he had even greater commercial triumphs with Oliver Nelson's arrangements and guitarist Wes Montgomery. His success opened the door for numerous organists. In fact, Smith and his organ disciples created an entire sub-industry in the recording world and club circuit. And Larry Young, more than any other, would expand the language of the organ into modal and more experimental areas. Even today, Jimmy Smith remains the boss. A selected discography of Jimmy Smith albums. A New Sound, A New Star, 1956, Blue Note. The Complete February 1957 Jimmy Smith Blue Note Sessions, Mosaic. House Party, 1957, Blue Note. The Sermon, 1958, Blue Note. Open House / Plain Talk, 1960, Blue Note. Back At The Chicken Shack, 1960, Blue Note. The Dynamic Duo, 1966, Verve.